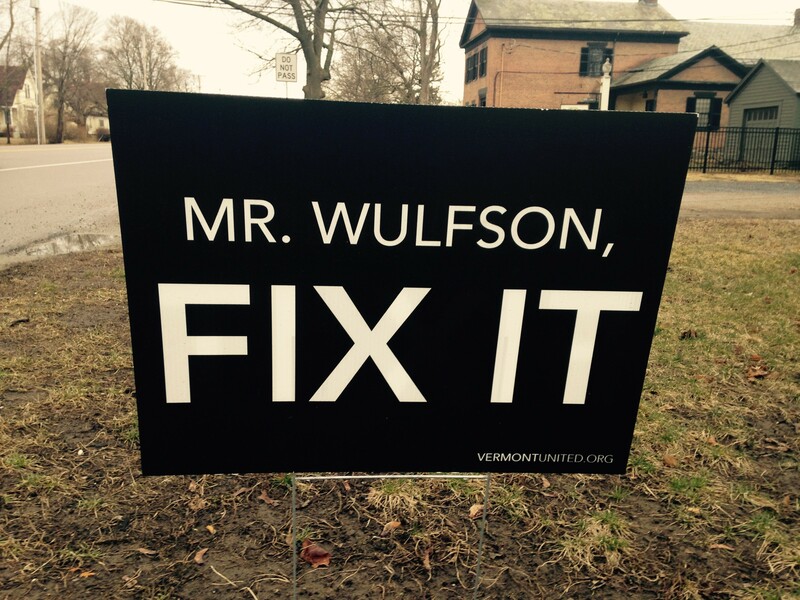 The sign along Route 7 in Shelburne Village reads: "Mr. Wulfson, FIX IT." The not-so-veiled message is yet another expression of opposition to Vermont Railway president David Wulfson's construction of a salt shed and a freight yard a mile north of the village. So far, the town has been unable to stop the intermodal freight project in court, but loud opposition is resounding in the court of public opinion in Shelburne. In addition to the signs, a Facebook group called Vermont United has been circulating a petition. Opponents have also purchased ads in the Shelburne News. And they've promoted a video featuring 10-year-old Madeleine Connery of Shelburne deploring the tree cutting and the potential for pollution at the site, which sits next to the LaPlatte River and land preserved by the Nature Conservancy Vermont Chapter. Connery also tells Wulfson to "fix it" in the video. Through his attorney, Peter Young, Wulfson declined to comment on the signs. But construction continues on the freight yard, which Vermont Railway is building under a legal federal preemption without local or state Act 250 environmental permits. The town has sued in federal court to stop the project, and a hearing date is set for May 3 to May 5. Supporters of the project say it's a good location with direct access to Route 7, and that intermodal freight yards help reduce long-haul truck traffic on the nation's highways. Town manager Joe Colangelo emphasized that the town, while opposed to the rail project, has nothing to do with the signs and said they are not permitted in the public right-of-way. "The signs were not given approval by the town and are therefore unpermitted, but it is impossible, given our current staffing levels, to police these types of signs," Colangelo wrote in an email to Seven Days. "Similarly, signs in support of politicians are not allowed in the public right-of-way but we are just unable to get around town to pull them out. It's a very difficult task to do during a presidential election season." Town officials enforce the sign rule when they can. In late January, the town notified Christopher and Christine Sharp of 5373 Shelburne Road that their Bernie Sanders sign in the shape of a cow was larger than what's allowed in the public right-of-way without a temporary sign permit. They took it down, according to Colangelo. The FIX IT sign in the village was posted in front of Brianne's Vintage Chic at 5462 Shelburne Road. The owner of the business did not respond to a message seeking comment.